Do flight delays often leave you agitated? Well, at Changi Internaional Airport you will in fact pray for delays and long layovers. That's the right. 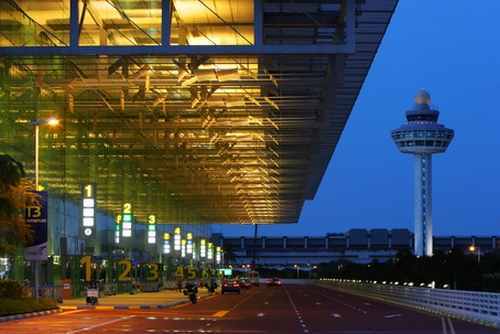 Read on further to find out what makes this airport so amazing. After all, it has won over 350 'Best' awards from leading travel groups and magazines. Miniature World Landmarks at T3 Departure Hall - an interesting display of quaint miniature iconic world landmarks complete viewers' travel road map around the world. 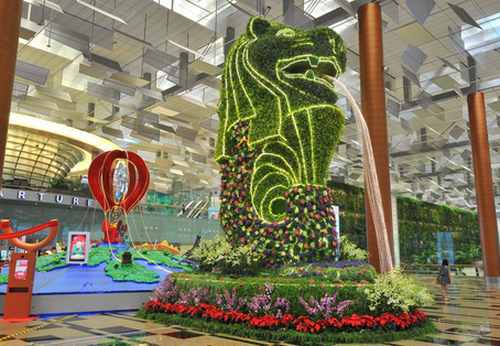 Merlion Topiary at T3 Departure Hall - Standing at 8 metres tall, the grand Merlion topiary beautifully decorated with colourful petals and lined with bright lights is a magnificent sight, befitting of its status as Singapore's most iconic symbol. 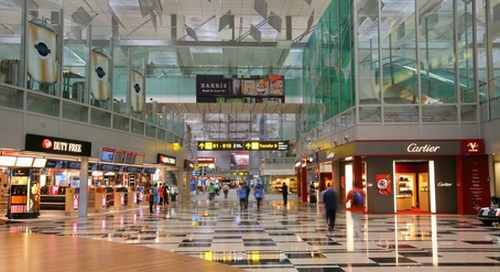 Changi Airport offers seamless Internet access for those carrying laptops and iPads via free Ethernet LAN points. For those without laptops or iPads, they can enjoy free surfing at more than 550 Internet terminals located throughout the airport's terminals. 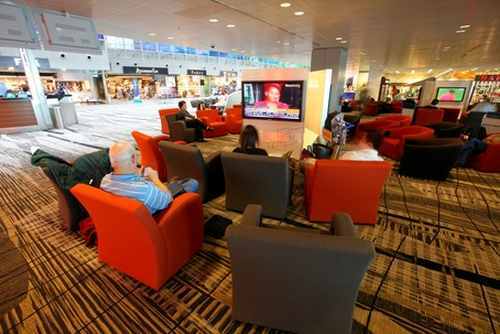 Travellers in Terminals 1, 2 and 3, Departure/ Transit Mall can catch the latest shows at the TV lounges. 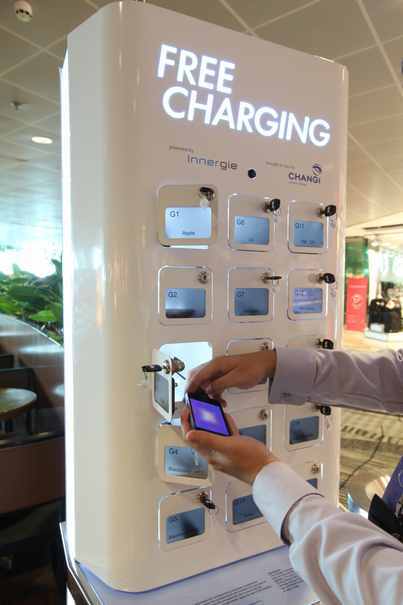 If you are at Changi, you don't have to worry about travelling on low on battery. With the mobile device charging stations, passengers can lock up their mobile devices while they charge and claim them later. Tired after all that flying time? 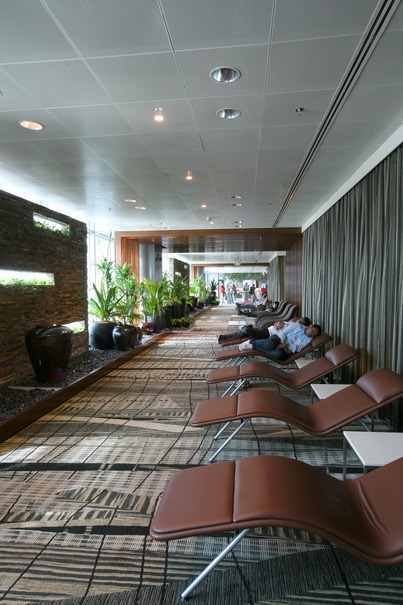 Make your way down to the rest areas for hours of relaxation on the specially-designed snooze chairs! These comfortable leather chairs come with head and leg rests, so stretch out for the ultimate relaxation. 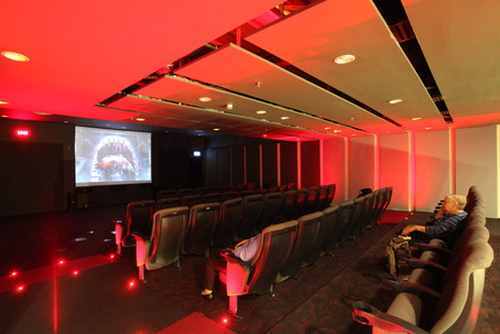 Die-hard movie fans can visit the Movie Theatres to catch the latest blockbusters for free, 24 hours daily. 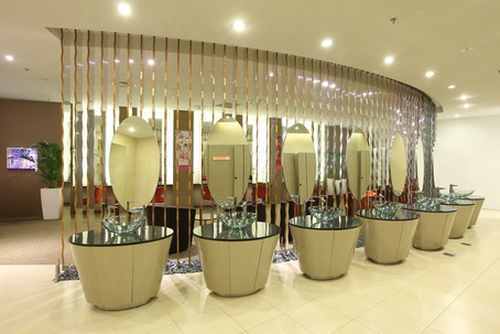 Located in Terminal 3 transit area, the powder room is a great place to freshen up in-between flights. 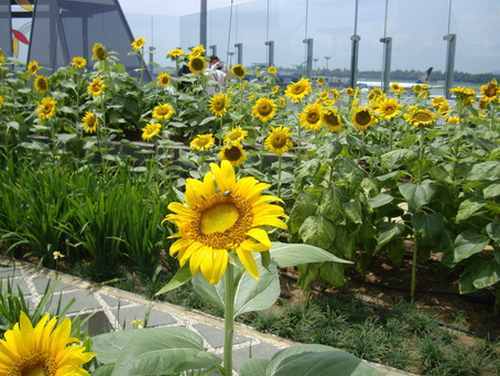 Be greeted by more than 500 sunflowers in the day and be enchanted by firefly-like bulbs at night. 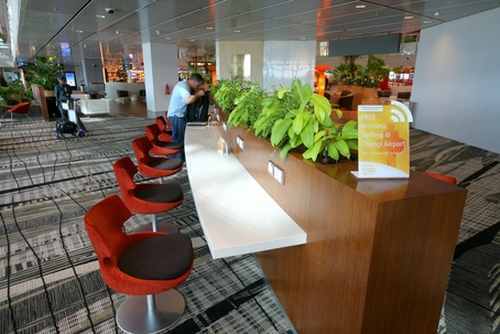 The garden gives travellers a vantage view of Changi Airport's airfield and weary travellers wanting a breather. 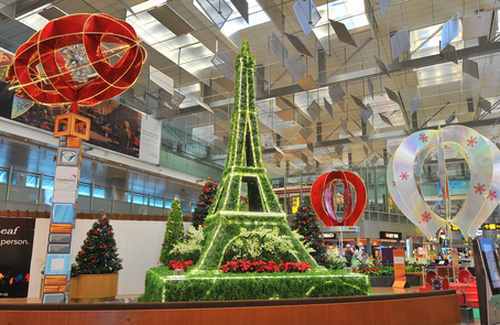 If you are travelling in the night, do drop by to see the spectacular feature light effects and illuminating fixtures. 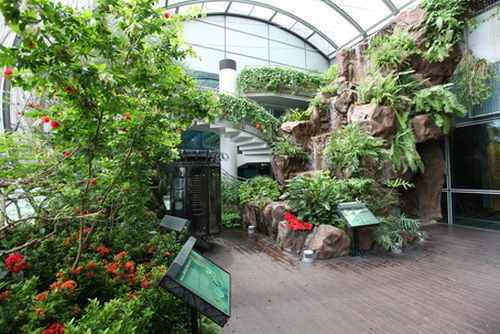 This 330 sqm, two-storey open-air garden is home to more than 1,000 free roaming butterflies that are native to Singapore and Malaysia. 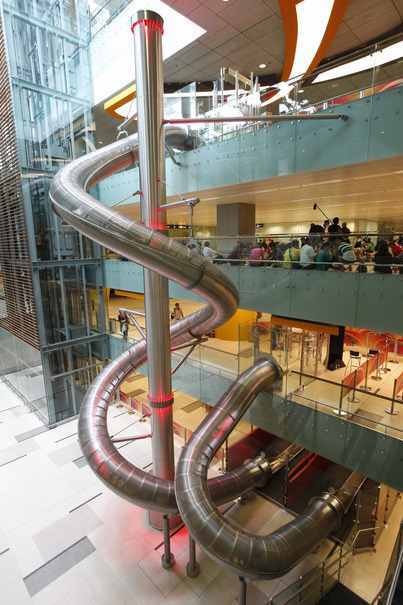 Take a ride on The Slide at Terminal 3, the world's tallest slide in an airport. Standing at a height of 12 metres high or four storeys tall, shriek your way down the slide while reaching top speeds of up to 6 metres per second! 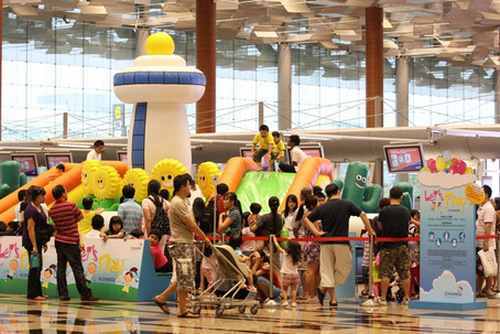 A place suitable for children aged from 1 to 12 to have moments of fun before their flight. The play areas are located in the transit areas in all terminals. The roof top swimming pool at Terminal 1 is a great way to spend your transit time basking in the tropical sun. There are shops selling items ranging from the traditional duty-free goods such as liquor and tobacco, cosmetics and fashionwear, to electronics and jewellery. 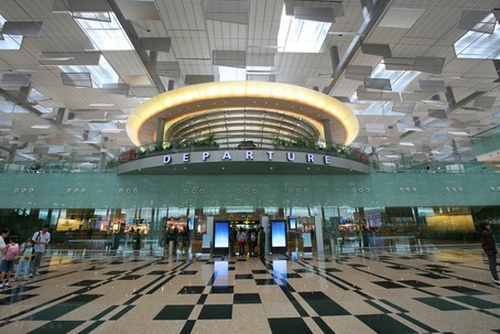 Now, wouldn't like to take a holiday to the Changi airport itself?